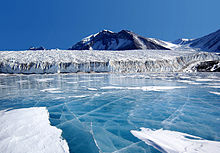 Antarctica is noted as the last region on Earth in recorded history to be discovered, unseen until 1820 when the Russian expion of Fabian Gottlieb von Bellingshausen and Mikhail Lazarev on Vostok and Mirny sighted the Fimbul ice shelf. The continent, however, remained largely neglected for the rest of the 19th century because of its hostile environment, lack of easily accessible resources, and isolation. In 1895, the first confirmed landing was conducted by a team of Norwegians. The First Russian Antarctic Expion 1819–1821. The First Russian Antarctic Expion led by Bellingshausen and Mikhail Lazarev on the 985-ton sloop-of-war Vostok ("East") and the 530-ton support vessel Mirny ("Peaceful") reached a point within 32 km (20 mi) of Queen Maud's Land and recorded the sight of an ice shelf at 69°21′28″S 2°14′50″W﻿ / ﻿69.35778°S 2.24722°W﻿ / -69.35778; -2.24722, on 27 January 1820, which became known as the Fimbul ice shelf. This happened three days before Bransfield sighted land and ten months before Palmer did so in November 1820. 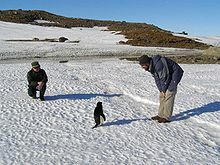 The first documented landing on Antarctica was by the American sealer John Davis, apparently at Hughes Bay, near Cape Charles, in West Antarctica on 7 February 1821, although some historians dispute this claim. The first recorded and confirmed landing was at Cape Adair in 1895 (by the Norwegian-Swedish whaling ship Antarctic). On 22 January 1840, two days after the discovery of the coast west of the Balleny Islands, some members of the crew of the 1837–40 expion of Jules Dumont d'Urville disembarked on the highest islet of a group of rocky islands about 4 km from Cape Géodésie on the coast of Adélie Land where they took some mineral, algae, and animal samples, erected the French flag and claimed French sovereignty over the territory. In December 1839, as part of the United States Exploring Expion of 1838–42 conducted by the United States Navy (sometimes called the "Ex. Ex. 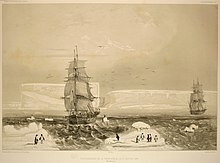 ", or "the Wilkes Expion"), an expion sailed from Sydney, Australia, into the Antarctic Ocean, as it was then known, and reported the discovery "of an Antarctic continent west of the Balleny Islands" on 25 January 1840. 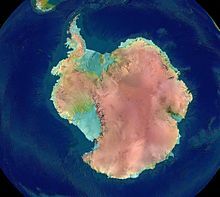 That part of Antarctica was named "Wilkes Land", a name it retains to this day. Explorer James Clark Ross passed through what is now known as the Ross Sea and discovered Ross Island (both of which were named after him) in 1841. He sailed along a huge wall of ice that was later named the Ross Ice Shelf. Mount Erebus and Mount Terror are named after two ships from his expion: HMS Erebus and Terror. Mercator Cooper landed in East Antarctica on 26 January 1853. During the Nimrod Expion led by Ernest Shackleton in 1907, parties led by Edgeworth David became the first to climb Mount Erebus and to reach the South Magnetic Pole. Douglas Mawson, who assumed the leadership of the Magnetic Pole party on their perilous return, went on to lead several expions until retiring in 1931. In addition, Shackleton and three other members of his expion made several firsts in December 1908 – February 1909: they were the first humans to traverse the Ross Ice Shelf, the first to traverse the Transantarctic Mountains (via the Beardmore Glacier), and the first to set foot on the South Polar Plateau. An expion led by Norwegian polar explorer Roald Amundsen from the ship Fram became the first to reach the geographic South Pole on 14 December 1911, using a route from the Bay of Whales and up the Axel Heiberg Glacier. One month later, the doomed Scott Expion reached the pole. Richard E. Byrd led several voyages to the Antarctic by plane in the 1930s and 1940s. He is cred with implementing mechanised land transport on the continent and conducting extensive geological and biological research. The first women to set foot on Antarctica did so in the 1930s with Caroline Mikkelsen landing on an island of Antarctica in 1935, and Ingrid Christensen stepping onto the mainland in 1937. The main mineral resource known on the continent is coal. It was first recorded near the Beardmore Glacier by Frank Wild on the Nimrod Expion, and now low-grade coal is known across many parts of the Transantarctic Mountains. The Prince Charles Mountains contain significant deposits of iron ore. 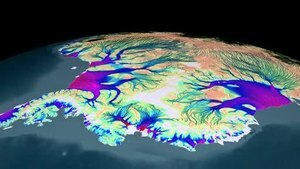 The most valuable resources of Antarctica lie offshore, namely the oil and natural gas fields found in the Ross Sea in 1973. 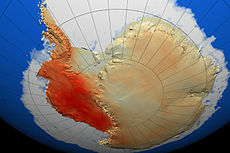 Exploitation of all mineral resources is banned until 2048 by the Protocol on Environmental Protection to the Antarctic Treaty. The Antarctic fur seal was very heavily hunted in the 18th and 19th centuries for its pelt by sealers from the United States and the United Kingdom. The Weddell seal, a "true seal", is named after Sir James Weddell, commander of British sealing expions in the Weddell Sea. Antarctic krill, which congregate in large schools, is the keystone species of the ecosystem of the Southern Ocean, and is an important food organism for whales, seals, leopard seals, fur seals, squid, icefish, penguins, albatrosses and many other birds. In 1983 the Antarctic Treaty Parties began negotiations on a convention to regulate mining in Antarctica. A coalition of international organisations launched a public pressure campaign to prevent any minerals development in the region, led largely by Greenpeace International, which operated its own scientific station—World Park Base—in the Ross Sea region from 1987 until 1991 and conducted annual expions to document environmental effects of humans on Antarctica. In 1988, the Convention on the Regulation of Antarctic Mineral Resources (CRAMRA) was adopted. The following year, however, Australia and France announced that they would not ratify the convention, rendering it dead for all intents and purposes. 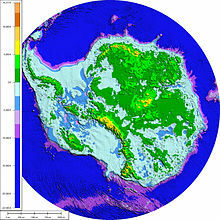 They proposed instead that a comprehensive regime to protect the Antarctic environment be negotiated in its place. 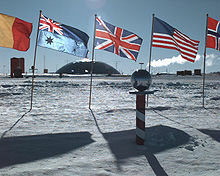 The Protocol on Environmental Protection to the Antarctic Treaty (the "Madrid Protocol") was negotiated as other countries followed suit and on 14 January 1998 it entered into force. The Madrid Protocol bans all mining in Antarctica, designating Antarctica a "natural reserve devoted to peace and science". Small-scale "expion tourism" has existed since 1957 and is currently subject to Antarctic Treaty and Environmental Protocol provisions, but in effect self-regulated by the International Association of Antarctica Tour Operators (IAATO). Not all vessels associated with Antarctic tourism are members of IAATO, but IAATO members account for 95% of the tourist activity. Travel is largely by small or medium ship, focusing on specific scenic locations with accessible concentrations of iconic wildlife. A total of 37,506 tourists visited during the 2006–07 Austral summer with nearly all of them coming from commercial ships; 38,478 were recorded in 2015–16. Meteorites from Antarctica are an important area of study of material formed early in the solar system; most are thought to come from asteroids, but some may have originated on larger planets. The first meteorite was found in 1912, and named the Adelie Land meteorite. In 1969, a Japanese expion discovered nine meteorites. Most of these meteorites have fallen onto the ice sheet in the last million years. 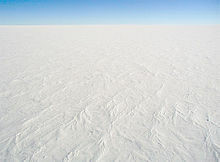 Motion of the ice sheet tends to concentrate the meteorites at blocking locations such as mountain ranges, with wind erosion bringing them to the surface after centuries beneath accumulated snowfall. Compared with meteorites collected in more temperate regions on Earth, the Antarctic meteorites are well-preserved. ^ James Cook, The Journals, ed by Philip Edwards. Penguin Books, 2003, p. 250. ^ Turner J.; Comiso J.C.; Marshall G.J. ; Lachlan-Cope T.A. ; Bracegirdle T.; Maksym T.; Merh M.P., Wang Z.; Orr A. (2009). 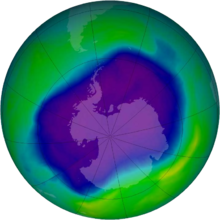 "Non-annular atmospheric circulation change induced by stratospheric ozone depletion and its role in the recent increase of Antarctic sea ice extent". Geophysical Research Letters. 36 (8): L08502. Bibcode:2009GeoRL..36.8502T. doi:10.1029/2009GL037524.